My name is Ginger Garner. I have my doctorate in physical therapy and for the past 25 years have helped folks overcome pain and stress through holistic practices best known as Lifestyle Medicine, which includes Functional & Integrative Medicine (FIM) practices. How can I help you? Pronounced (You-da-mommy-ah! ), EudeMOMia™ is derived from the Greek word, Eudaimonia, with Aristotle as the originator of the concept, which means moving beyond mere happiness. EudeMOMia™ describes the mother who works with purpose & passion, seeks health & balance in all areas of her life, spiritually, physically, intellectually, energetically and emotionally, and is not content to merely chase fleeting happiness. Rather than hedonistic pleasure-seeking & taking the “easy” path at the expense of pain & growth, EudeMOMia™ describes what I want for all mothers, a place where we move from recovery to discovery, where we recognize our full potential. It describes what I pursue – as a working woman, mother of three, wife, & therapist. I want whole health and a purpose-filled life for you, fellow mother, you who nurtures the next generation through blood, sweat, and tears, and do so every day in the face of continued inequality & discrimination in the workplace and healthcare. Empowering you, helping you move from recovery after giving birth, to discovery of your best self, is the goal of EudeMOMia™. I began using yoga and Pilates in physical therapy and athletic training practice back in the 1990’s, long before it was the cool or trendy thing to do. But I learned quickly as a budding therapist in women’s health, using these modalities were far more effective when used with physical therapy, especially in helping women with chronic and persistent pain. As a result, I began documenting my methods in order to train other healthcare providers using a yoga-inspired interdisciplinary, biopsychosocial model; and in 2000, I launched the first yoga program for training licensed healthcare professionals in the world, Professional Yoga Therapy Institute®. Over time, I added more FIM modalities, like nutrition and sleep as a focus during physical therapy and ended up penning my first textbook on the topic, which I discuss below. This transformation of my practice wasn’t easy to start or grow, being a woman and mother in 2 male dominated fields – both yoga and medicine have their guru & doctor as god complexes. Trying to bring yoga into healthcare (not healthcare to yoga) by launching a brand new idea 20 years ago, with few women found at the creative leadership table worldwide, remains difficult. Even today, the yoga community struggles with understanding the important difference between yoga, yoga therapy, and yoga in healthcare. Nevertheless, I persist. As a mother of three and a working woman, I will continue to advocate for women to have access to scientifically and medically sound biopsychosocial & FIM-based care in healthcare in the United States and abroad, until all mothers receive the compassionate, humane care they need and deserve. 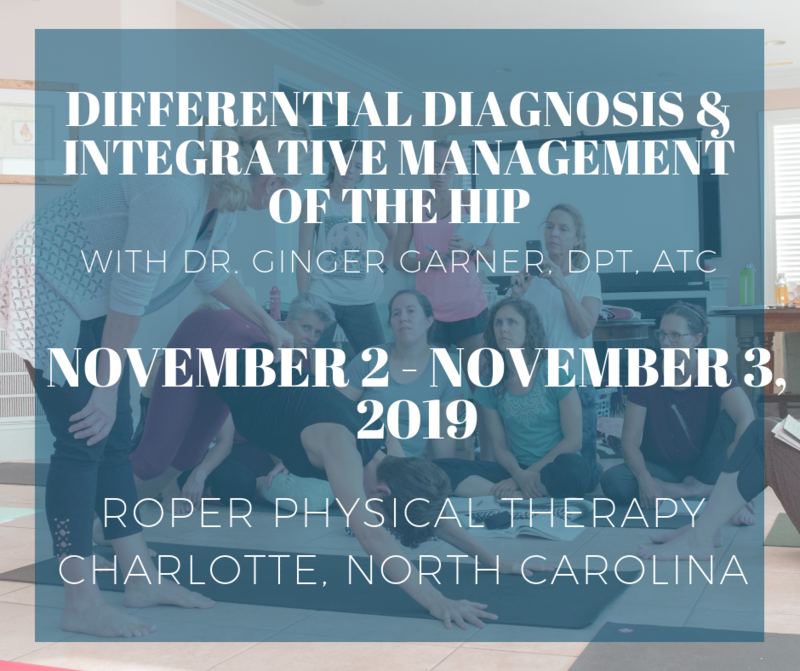 Dr. G is a University of North Carolina at Chapel Hill trained doctor of physical therapy (DPT), as well as a licensed athletic trainer (LAT, ATC) and professional yoga therapist (PYT). Dr. G has spent 25 years studying and creating “best fit” yoga practices in and outside of healthcare. She is the founder of Professional Yoga Therapy InstituteTM and author of Medical Therapeutic Yoga © 2016. How can Medical Therapeutic Yoga help you? Combining yoga with medical science makes yoga more powerful and more effective, which is the focus of Medical Therapeutic Yoga©. The landmark text is more than just a book, it is a multi-media platform and audio-visual experience, offering a home practice of dozens of videos that teach you safe, scientifically supported methods for practicing yoga. More than two decades of practice and study in yoga, physical therapy, and sports medicine went into the medical textbook. MTY is a guidebook that can help reform healthcare, transcend the need for dogma and lineage turf wars, escape the oppressive and abusive environment controlled by patriarchal “gurus,”address the opioid crisis, and simply evolve yoga by integrating rehab science. The systems-based methodology in MTY has also been field-tested for over 15 years by the multitudes of licensed health care providers that Dr. G has personally trained. The book was born from successful practices Ginger has used with treating people with chronic pain, especially women’s health, over the last 25 years. Want to join the movement? Dr. G’s mission is to revolutionize healthcare through mindful, evidence-informed yoga prescription. Step 1 — Dig in to all the great content Dr. G has for you right here. Want to practice yoga with Ginger? Want to become a Yoga Therapist? Step 2 — Get a copy of MTY and learn how to make your yoga practice safer and more effective. Step 3 — Pop over to MedicalTherapeuticYoga.com and register where you can get access to yoga videos and download a FREE book excerpt. & READ THE PREFACE & CHAPTER 1 FOR FREE. What does Dr. G have to say? Check out some of her most popular blog posts. The Minimalist Nursery - What Does Baby Really Need? How do I stay in touch with Dr. G? Subscribe to the newsletter & stay in touch on social media! Media Inquiries click below. People in chronic pain are often labeled, and the labels are not helpful, person-centered or even nice. Often deemed failures of the system, they get stereotyped, dehumanized by such labels as diagnosis seeker, prescription drug addict, wimpy complainer, or motor moron. But I don’t see people in pain that way. To me, those people are not failures of the system. Rather, I believe the system has failed them. The system I speak of is, of course, the American healthcare system. Please let me share my story with you, albeit the greatly abbreviated version. What’s coming up on the calendar?